In February 2018, Wordy Birdy (Doubleday), written by yours truly and illustrated by Dave Mottram, was released. 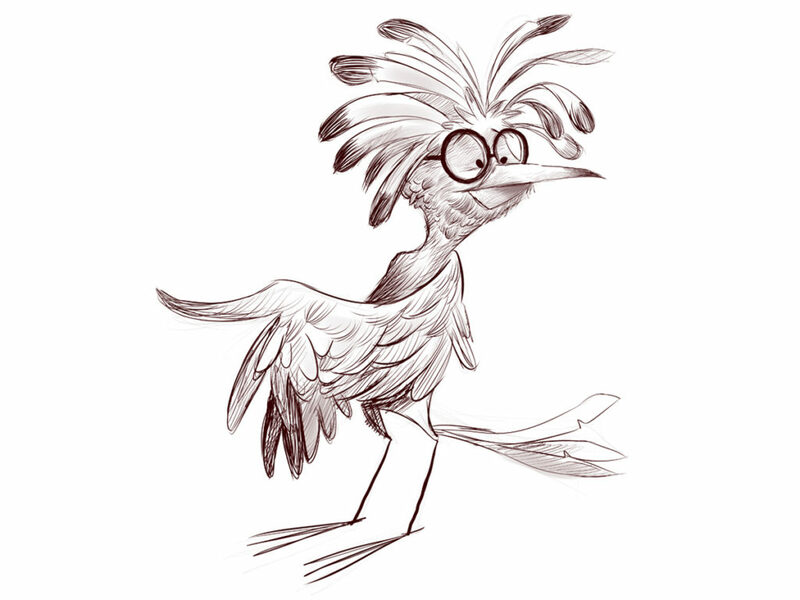 Wordy Birdy is a bird who loves to talk, talk, talk. But she never listens. In fact, Wordy Birdy has so much to say, she has another book due out February 5, 2019. It’s called Wordy Birdy Meets Mr. Cougarpants. In the first book, Wordy Birdy’s talking gets her into some big trouble. In the second book, Wordy Birdy’s constant chatter saves the day. 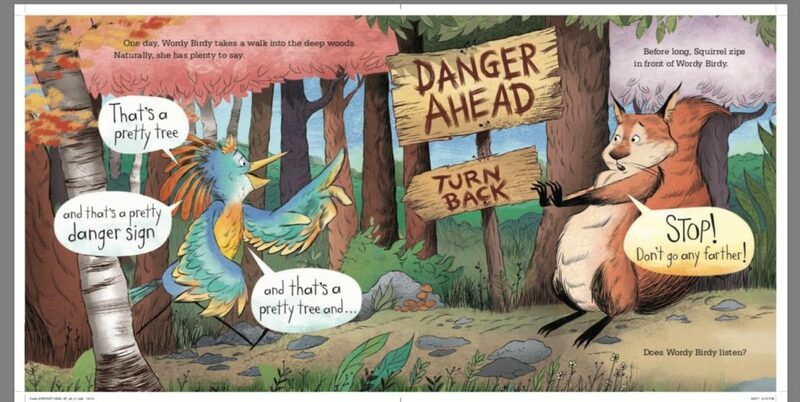 Today, Wordy Birdy is going to do her very best to stay quiet and let illustrator Dave Mottram be the star of this post. 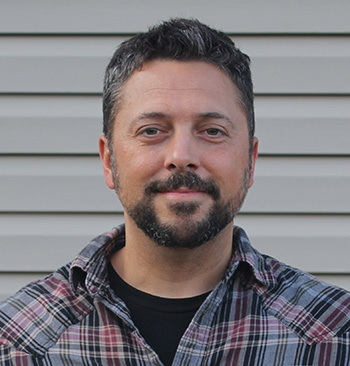 Welcome to Picture Book Builders, Dave! Thanks Tammi! I’m happy to chat! Shortly after I accepted the offer for the two Wordy Birdy books, our oh-so-amazing editor, Frances Gilbert, sent a picture of your Caffeinated Owl Chart my way. That was all I needed to see to know you’d be the perfect fit for Wordy Birdy! Immediately, I was taken by your humor and your ability to capture expressions. Tell us a little about this flock. Sure. So I had drawn a small parliament of Owls a few years ago in pencil. Someone was using them as a meme for coffee. After I saw that, I thought – Hey, I drew these. So I took my drawings and made them into a small chart. My grandmother loved Owls. Every time, I went over her house she would have a new ceramic Owl. Eventually, there were little Owls all over her house. I would spend my time over there looking at them over and over. Since then, Owls have always been my favorites. What first drew you to illustrating the Wordy Birdy books? 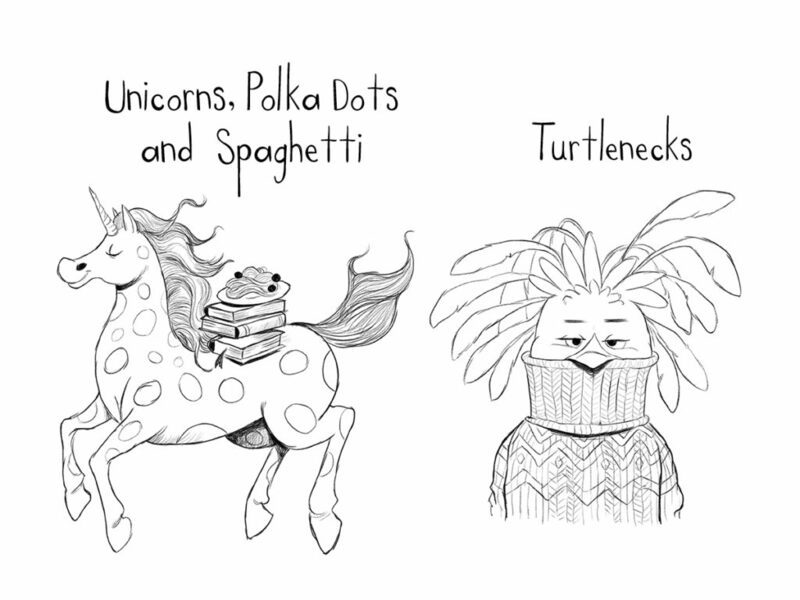 Was it her love of spaghetti and unicorns? Maybe her aversion to tuna salad and turtlenecks? Ha! Yes! she loved Unicorns! I really liked her character. Plus, I can totally relate to being the one who is talking and talking. But, I can also relate to the other animals who are – Please listen and stop talking! I love drawing birds. 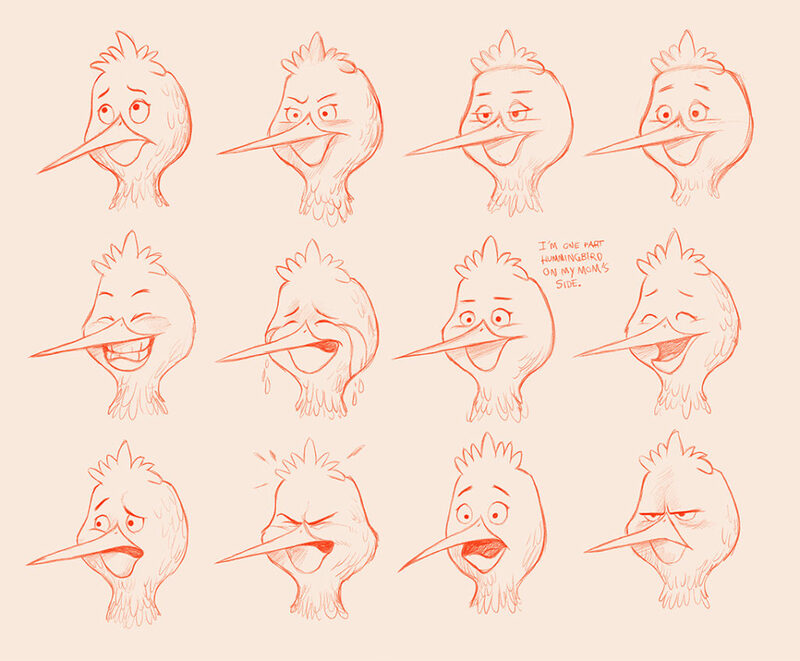 It was an enjoyable process to sketch out a flock of Wordy Birdies. Plus, when there’s a great sense of humor behind the characters, I’m all in. When we were initially coming up with Wordy, we drew inspiration from Phyllis Diller and Iris Apfel. She had been drawn with big, fashionable glasses but we decided she looked older than desired. She needed to have LOUD and bright colors. So, she has flaming orange feathers on her head and wings that taper to a blue. Then, there were the friends. Rabbit is floppy and really laid back. Squirrel has a bushy tail and always looks direct. 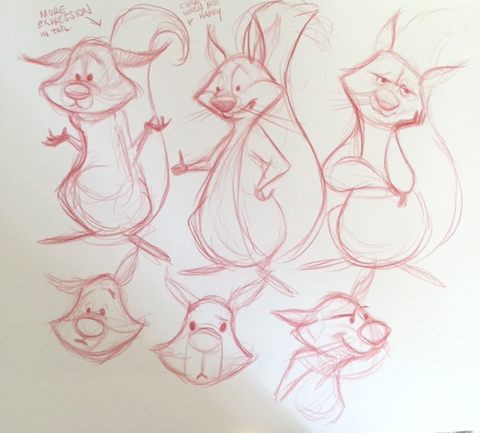 He’s a squirrel of few words ( the opposite of Wordy). Raccoon is like the older sister that is kind of balancing everything out. 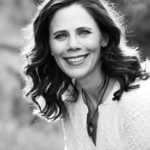 Can you share a little about your process? My process is always changing it seems. I wish I could lock down a way of doing things and simply follow it every time. When I’m working on a book, I want the process to follow the characters and story – so I let that drive the medium & style. With Wordy, that was different. I was selected because of the Owls I drew, so the style was already set. These days, I bounce around between Digital and Traditional. I enjoy them both. I’ve always loved the feel of pencil to paper. The roughness of the paper and smearing the graphite. 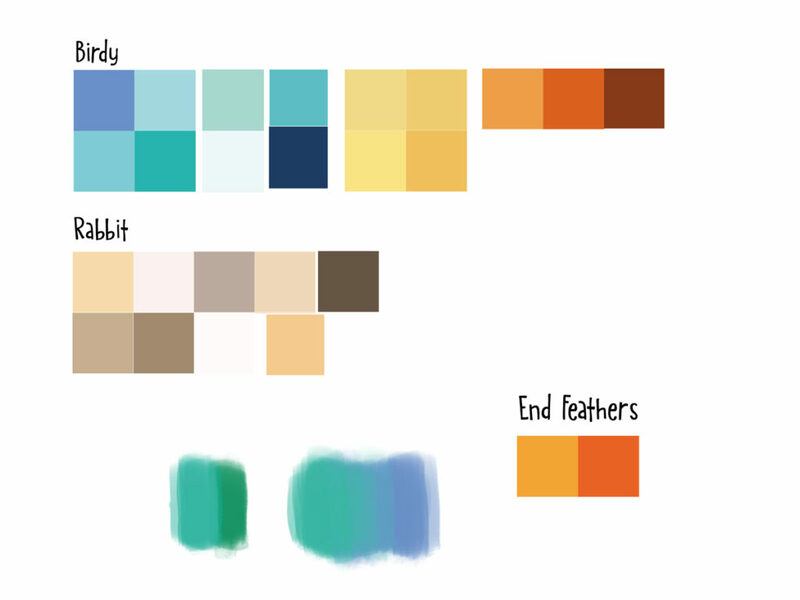 Lately, it’s been sketching on paper and coloring digitally using Photoshop. Also, the iPad has changed things in a way that I can take my work wherever I go. I draw on that as well. I wish there were more animals here! So I’m adding them. I have loved viewing your work on Instagram. It’s clear that you are big on putting in the practice. What inspires you to create these pieces? Thanks! I try to do a sketch early in the AM. Usually it’s just for me. It’s like morning meditation and coffee to me. Just something that is on my mind or maybe I want to understand an animal better. Sometimes, if I draw something enough – I can picture it better in my mind. That really helps. Can you share a couple of your recent favorites? 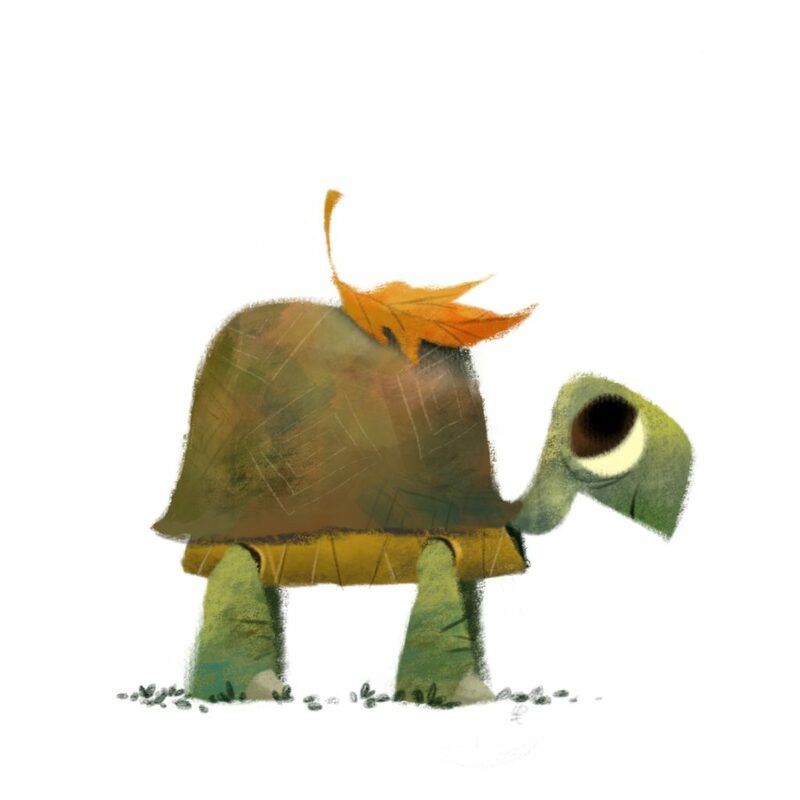 I like this turtle because I’ve been trying to get back to working simpler. 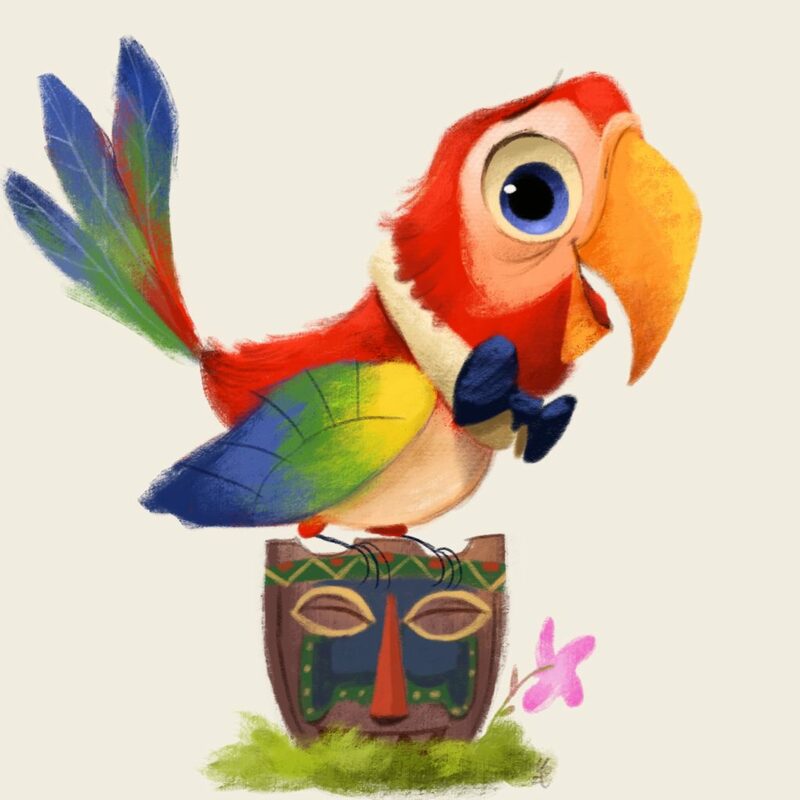 Tiki bird is because I have always loved Tikis and the The Enchanted Tiki Room. 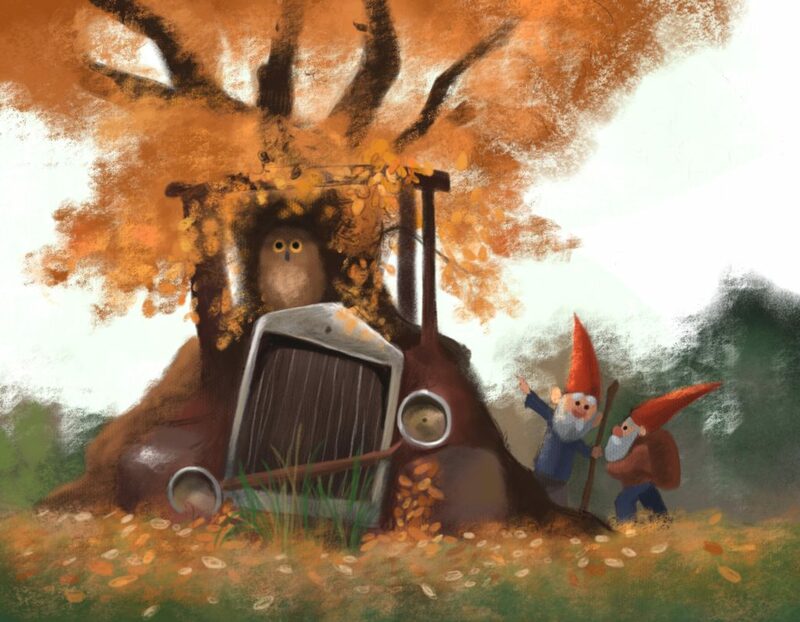 The gnomes because I’m trying to get better at doing backgrounds and the characters working together. I just finished a book called Emergency Kittens! It’s about 3 super kittens that save the day with nothing but sheer cuteness. 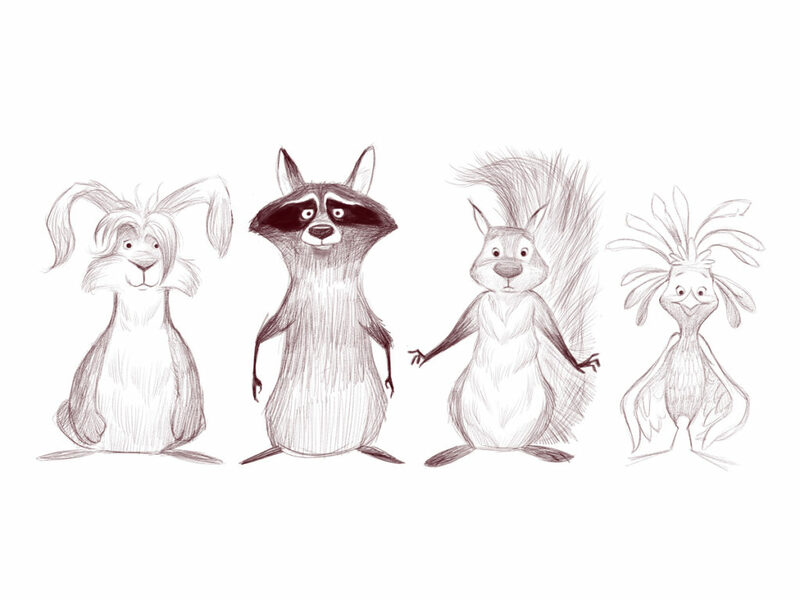 I’m currently working a picture book called Willow the Armadillo. Dave Mottram is an illustrator living in Ohio who worked as a graphic designer for various agencies which led him to pursue his passion for illustration. He paints traditionally and digitally with color and layers. He loves tikis, tacos, animals, and geeking out on Art Supplies. 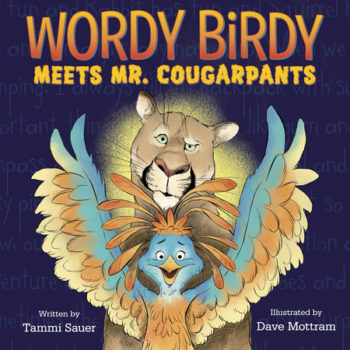 One lucky duck will receive a copy of Wordy Birdy Meets Mr. Cougarpants. ANOTHER lucky duck will receive an original Wordy Birdy sketch from Dave! For a chance to win, leave a comment and/or share this post on Twitter. Make sure to tag Dave (@dmott70) and Tammi (@SauerTammi). Puppies are about to invade their mailboxes. They each won a signed copy of The Great Puppy Invasion. Loved seeing the art in process! Wordy Bird is such a fun, child-like read. I have 3 little wordy birds in my house. We loved the first book. And can’t wait for the sequel! I loved seeing the journey of the art here. Great interview! Loved the first Wordy Book so I can’t wait to read the next one. Congrats! This book looks wonderful on so many levels -can’t wait to get my hands on this one! Congrats! We are big fans of Wordy Birdy in this house! In fact, I live with my own Wordy Birdy and would love to share this new book with him! I just love these illustrations…thanks for sharing! Glad you enjoyed the post, Katie! This looks fun. I realized the sketches and playing with them to come up with something that works is similar to writing the story, playing with characters, settings, conflict. Wonderful post. Thank you. Yes! Both definitely require brainstorming and fine-tuning. Love his style capturing expressions! Perfect. Love the parliament of owls, and of course, sweet Gracie! Thanks for stopping by Picture Book Builders, Maria! Always love the behind the scenes interviews. Looking forward to Wordy Birdy meeting Mr. Cougarpants! I enjoy seeing raw art and how it transforms into the finished product. So much humor shown through the illustrations! Awesome interview! It’s always great to learn how artists work and invigorating to know I am not the only person who steps (aka: throws oneself) into different projects different ways. Looking forward to the book. It was so cool to see this. I just love art and am always amazed and impressed at how truly difficult this process really is. Thanks for sharing. I’m not generally a fan of digitalized art, having been a traditional artist all my life. You have found the happy medium. I love what you do! Thanks for checking out the post, Sheri! Loved the post and all the process pics! As a writer it’s so valuable to learn as much as I can about the “other side” (the artists) who have just as much ownership over the project as the writer. Beautiful and fun artwork! Looking forward to cougarpants! AND I WON A SIGNED BOOK!!!???! PUPPIES ARE LITERALLY GOING TO INVADE MY MAILBOX! Thank you! The post was in my inbox at 10:06 a.m. And then when I check the email and look at the post on the Web site at 3:10 p.m. the contest is over? I’m not sure I understand not even giving this a day. This post just mentions the winners from my previous post. I am a huge fan of Wordy Birdy! Can’t wait to get my hands on the next one. Such a great post. 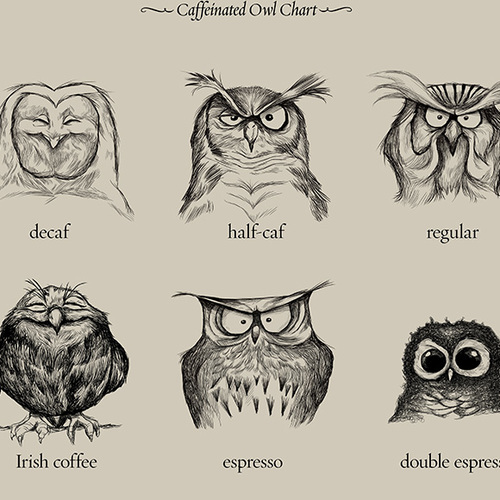 Where can I buy the caffeinated owl chart?? Love it so much!! This was such a fun interview! I love hearing all the behind the scenes information. So interesting! And my kids love Wordy Birdie! We are excited to read the next book. I love the art in both books. 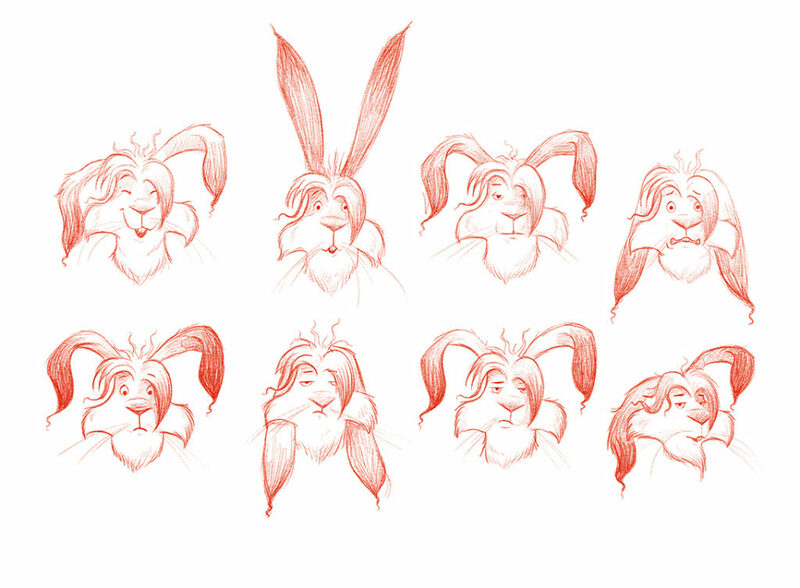 Enjoyed reading about the process you use and I loved seeing the practice sketches. Thank you to Dave for sharing your story. Such talent! Thanks for the great interview. Wordy Birdie was such a fun read, I am looking forward to this next adventure! This is fascinating! Thank you for sharing these great behind the scenes details! That caffeinated owl art is great. Fun to learn about the process. 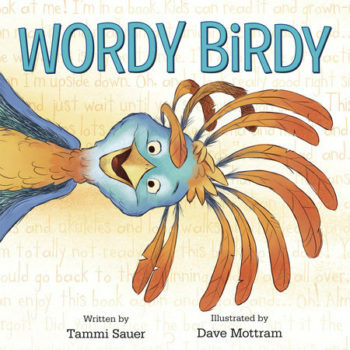 I have a huge collection of Tammi Sauer books, but I haven’t met Wordy Birdy yet. The artwork is adorable so I enjoyed learning about the artist. These sketches fill me with so much joy. I look forward to seeing more. Tammi, the first WORDY BIRDY was so much fun. I can see her resemblance to Phyllis Diller. Now I’m looking forward to Wordy Birdy meeting Mr. Cougar Pants. I’ve got to check out these two Wordy Birdies! There is so much good about all of this that it’s hard to summarize in a comment. Love, love, love your art and your Wordy Birdy character. Carry on! I love Wordy Birdy (the story) and Wordy Birdy (the illustrations). Really enjoyed hearing about what goes on in creating the fun Birdy pics. I can’t wait to read this! The first WORDY BIRDY is so fun and the illustrations are so scrumptious. Thank you for sharing your process. I’m glad you enjoyed the interview, Cathy! A ketch or wordy birdy…what an opportunity. New book is already on order. I love the art in the first book, can not wait to see the next book. Tammi and Dave, Your characters jump off the page right into the reader’s headspace. I love watching kids listen to me read the Wordy Birdy story. They start squirming, dying to talk, because they are so engaged with the characters. Thanks Dave and Tammi for sharing the inside scoop on Wordy Birdy’s sequel. Can’t wait to read it! You had me at Mr. Cougarpants. Thanks for the great post/sketches and congrats on the upcoming book! Congrats on the sequel & thanks for sharing the illustration process! And thank you again for The Great Puppy Invasion – can’t wait to read it! Oh, what fun. I loved seeing all the art! Oh, the ART! Wonderful look into the behind the scenes process. Those caffeinated owls are the best. I’m always amazed to see how artists work and create. I can’t draw to save my life so its so incredible to me. Thank you so much for sharing! Tammi, seeing this process is HUGE! Thanks, lady! 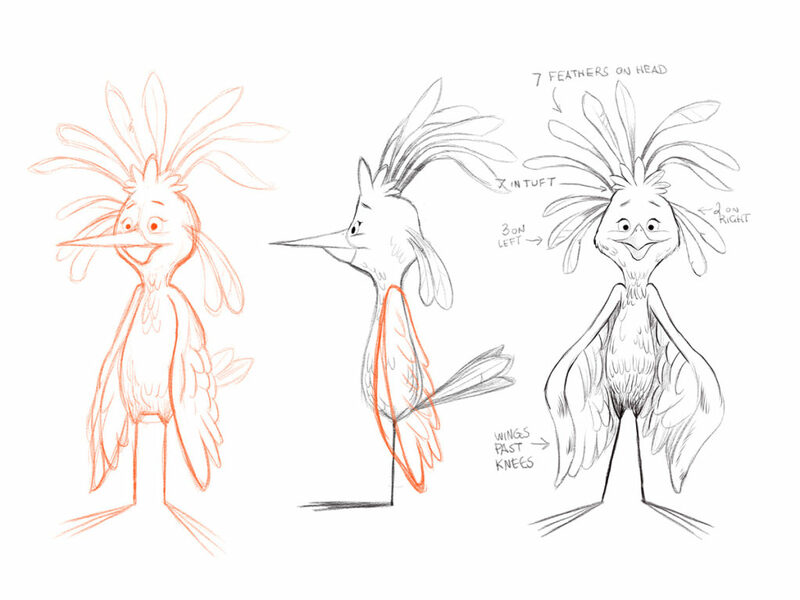 I loved seeing the character design process. Amazing art and great interview! Love seeing the illustration process! I’m in awe of all the time and the layers it takes to make the beautiful illustrations. Can’t wait to see what Wordy Birdy does to Mr. Cougarpants or vise versa. This process is inspiring. Love your wit and words coupled with illustrations. Keep writing! We read Wordy Birdy Meets Mr. Cougarpants last week and then shared this post with them. 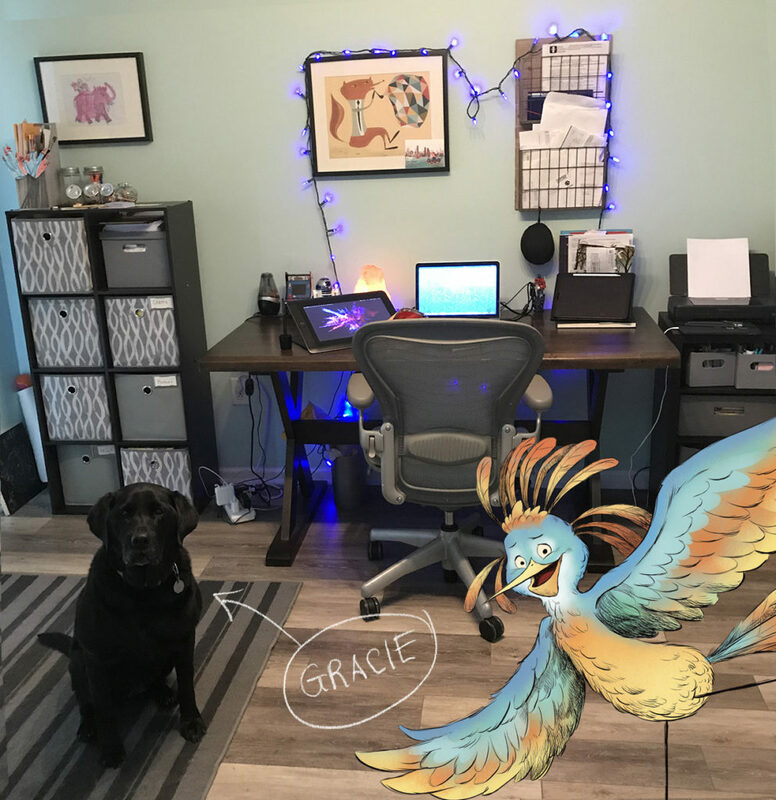 They loved learning more about the creative process and hope there’s going to be more Wordy Birdy adventures!! Wordy Birdy has brought me so much joy! I love sharing it with kids! It’s one of my all-time favorites to read aloud. I’d love to frame a piece of art for my school! I’m late to this but loved seeing everything. Those owls!!! And I want to read the new kitten book!!! 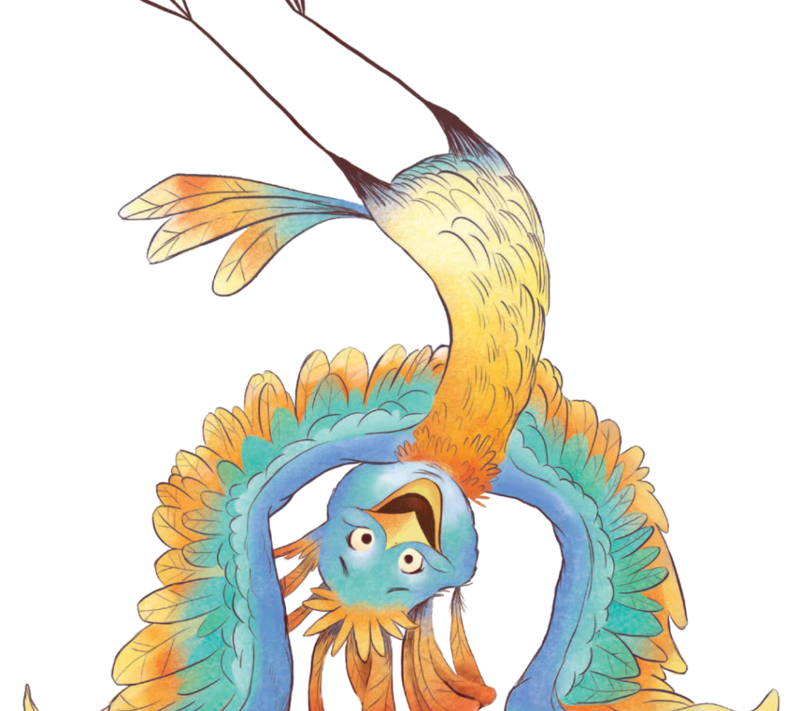 Thank goodness my bird phobia doesn’t apply to picture book characters because Wordy Birdy is feathers and beaks above the flock.